Rolls off the tongue, doesn't it? Well, no, but names, like style, are superficial concepts so don't take any notice that the HANNSnara is part of the company's Style range, as looks-wise, it ain't all that. It doesn't swivel and has removable speakers that look better on paper than in reality as it looks more natural without them, which is a shame if you don't have external alternatives. It's got a decently configured backside, but for the rather tight provision of HDMIs - there's just the one. Scarts come as a pair and along with a component video input and one for a PC. There's more on the side too with the familiar analogue inputs and headphone jack hiding their antiquity behind a flap. 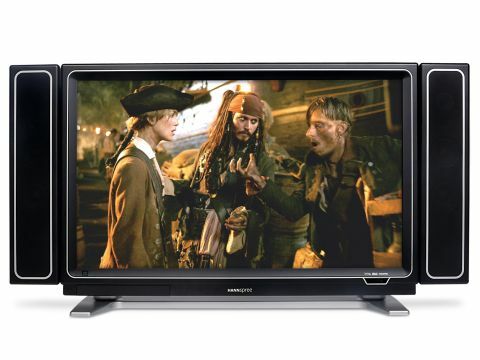 But picture quality puts you back in the modern age as we discovered with the HD material courtesy of Pirates of the Caribbean 2. It ticks most picture quality boxes with decent levels of detail and black levels and a clean colour palette, but for all that it still needs a good dose of natural daylight to achieve it. Otherwise, the sorcery inside isn't quite able to match the performance of many pricier LCD screens. The Black Pearl is more gunmetal grey and the wisps of Jack Sparrow's whiskers suggest he's aged considerably since the last scene. Unsurprisingly, SD dropped off a little with detail softening, and colours diluting somewhat. However, the absence of a built-in digital tuner means these minor compromises will only affect you on the handful of channels you can extract from it. As for the audio, cutlasses clash and muskets explode clearly enough to make you glad it's on the telly, while the in-built speakers handle the soundtrack with relative ease. Operationally, this TV is much more like walking the plank when it should be a walk in the park. While the onscreen menus are fine, the handset might benefit from being reduced underfoot to shrapnel and fired out of a ten-pounder gun. That way, when you plucked it out of the water and pieced it together differently the buttons might be in the right place and able to operate a telly sensibly. We still wonder how one would change the TV's aspect ratio. We also thought the remote might help here, but were wrong... oh well. It's important that new technology can be stripped down to an affordable level and this strangely-monikered box of tricks does that, offering both decent hi-def material and good audio. But unless you're running low on gold coins, the tricks may not be smart enough to make it worth your while.